Finally! We watch a movie in class that is actually worth watching! I cannot believe that Ferris Bueller's Day Off (1986) is the first John Hughes film I have ever watched...I feel so slack. If only the DVD shop had more of his films! 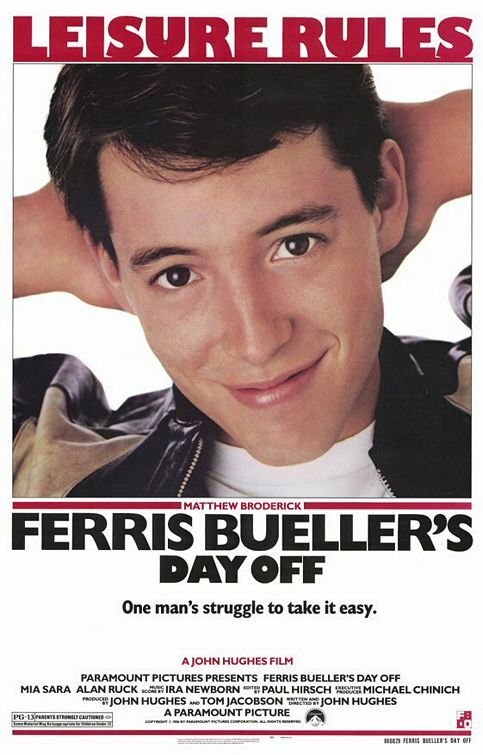 Ferris Bueller (Matthew Broderick) is just a regular teenager who is faking a sickie to get out of school for a day. He gets his sick friend Cameron (Alan Ruck) to come out for a day in the city, and he somehow manages to get his girlfriend Sloane (Mia Sara) out of school for the day too so she can come along. The three get up to some crazy things, with Ferris being the ringleader. But his prinicipal and sister (Jennifer Grey) are on to Ferris wagging, and are out to catch him before it's too late. Literally, this could have been a really stupid film, but it wasn't. All of it's stupidity somehow manifested itself into something great. Maybe it was the uber-cool soundtrack or the awesomeness of Matthew Broderick, or maybe it was just a really great film to come out of the 80's. If only all teen comedies could be as clever and funny as this one was. Unfortunately, we don't live in a world like that anymore. It's worth seeing for the parade scene alone! Seeing Ferris sing along to The Beatles is really uplifting and will have you dancing in your seat! Ferris is awesome. I've seen this movie like 50 times since it first came out. This is my personal favorite of all the John Hughes movies, but there are several more that are very good as well. Like Sixteen Candles, The Breakfast Club and Weird Science. If you borrow them or rent them, you won't regret it. I plan to find them, John Hughes was a genius! This one is a delight. Funny, easy viewing and quotable perfect for a laidback afternoon.